gscblog2013 | The greatest WordPress.com site in all the land! These cosmos seeds were packed for 2011, so I want to test them. I’ll fold up the moist paper towel and slip this into the plastic bag. The whole thing goes on top of my refrigerator to encourage germination. The seed packet says to expect germination in 7 to 10 days. If results are good, I’ll plant the rest of the packet in soil. I hung the packet on my desk lamp to take advantage of the warmth. 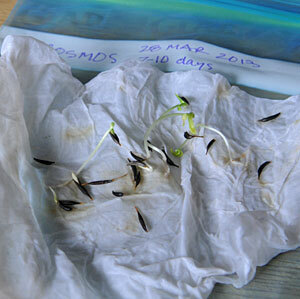 Within a week, I saw 50 percent of the seeds germinate. By two weeks, 90 percent had germinated. Good seeds! I’ll plant the rest in soil. I hear this question a lot at this time of year. What to do? Test a few of the seeds to see what you’ve got. If you get decent results in a germination test, it’s worth planting. If not, compost the old seeds. The first step is to put 10 seeds in a damp paper towel and nestle it in a plastic bag for a few days — preferably in a spot that’s about 70 degrees F. — or warmer. Most seed packets will tell you “days to germination.” After the expected number of days have passed, check to see how many sprout. If you get more than 50 percent germination, you might want to give it try, planting two or three seeds to a cell. If nothing sprouts, all you’ve lost is a paper towel and 5 minutes. Some types of seed are good for four to five years, but others are more perishable. Last week, I found myself looking out the window and watching it snow in mid-April. I began to think about these bumper stickers we have that say “Practice Random Acts of Gardening.” I was trying to think, what would be a random act of gardening — even if I could not be in the garden yet? What do you think? What other random acts could we have done with these slipcovers? I hear some employees have found the larger sizes make an interesting skirt! Chip Fiess works in e-commerce at Gardeners Supply and grows a small garden off the deck of his condo. He wants to inspire a new generation of gardeners to get dirty, have fun and grow food! LA Guerrilla Gardeners removed trash, weeds and dead plants from this median strip and installed new plants. Their signature “Please Water Me!” sign asks passersby to help with upkeep. After LA Guerrilla Gardeners planted the “Spaceland” garden, below, the city installed a wheelchair ramp to make the sidewalk more accessible. LA Guerrilla Gardeners volunteers are as young as 2 and as old as 85. Armed with shovels, seeds, plants, watering cans and compost, guerrilla gardeners are transforming ugly, underutilized or abandoned public land overnight — without permission. City-dwellers have seen flowers, herbs and shrubs spring up on neglected medians, in abandoned lots and beside previously trash-strewn sidewalks. Defined as “the illicit cultivation of someone else’s land” by Richard Reynolds, the modern-day spokesman for the worldwide movement, guerrilla gardening is happening in cities everywhere. Reynolds, who lives in the U.K., began planting and tending flowerbeds, borders and entire gardens in 2004 in what he describes as London’s orphaned land. “I’ve either done or helped organize about 70 different guerrilla gardens, from a little tree pit or patch of bulbs, to a roundabout,” says Reynolds. “The London lavender field is the one I’m most proud of,” says Reynolds, “because it’s big, beautiful, long-lived, looks good all year around, produces a crop of fund-raising lavender, is nature-friendly, and looks quite unlike other London traffic islands.” Each August, Reynolds and volunteers harvest dried lavender from the field and use it to create fragrant, handmade pillows, which are sold on his guerrillagardening.org blog. All the proceeds help fund new and existing guerrilla gardening projects in London. In the U.S., guerrilla gardening has been active since the 1970s, when New York City’s “Green Guerillas” began to cultivate fenced-off land by tossing in tomato seeds contained within rudimentary “seed bombs.” The group remains active today as a nonprofit resource center for community gardeners. Los Angeles Guerrilla Gardening (LAGG) started in Hollywood, CA., on a summer night in 2008. Today its troop of volunteers, who organize online and use aliases for fun, maintains more than 20 gardens they have installed during “digs” all over metro Los Angeles. A troop of LA Guerrilla Gardeners takes a break during a nighttime dig. Feeling rebellious? Tell us about your plans to plant sunflowers in an unexpected place, and you could win free sunflower seeds from Gardener’s Supply Company! Reynolds also believes guerrilla gardening can stretch beyond city lines to small towns and rural areas. “There’s always a patch of ground where a gardener can see more potential than whoever looks after it, and has the inclination to do it,” he says. Donna Avery created a kitchen garden, using our Colorful Grow Beds, shown right after planting in January. What inspired you to plant this garden? My handyman and I came up with the garden plan together, But it was your beautiful blue beds that were the inspiration for this project. Most of the time I do the work myself but this job was too big for me. The area is framed with non-pressure-treated wood. Even though the wood would never touch the beds I felt the garden would not be truly organic with pressure-treated wood anywhere in the garden. After the framing was done, gravel was put in and the beds and liners were installed. The last step was a layer of decomposed granite. Where does garden fit into your landscape? The area I used was just a part of my lawn. If I have my way I will replace the whole lawn with blue garden beds in the next year. So please, don’t stop selling them! When did you start? The garden was built in January. Thank God for our beautiful southern California weather. I live in Sunset garden zone 18, in the San Fernando Valley. Any lessons learned? Things you’d have done differently? The only thing I could think of is I should of gone bigger! But I needed to save some money for the 18 new fruit trees I planted last month. I now have 35 dwarf fruit trees in my yard in large pots. What about the white fencing? Decorative or functional? The fencing was for one reason, and her name is Piper, my 3-pound (at the time) black poodle mix puppy. As soon as I put the fencing in and planted my strawberry plants, Piper stuck her head through the fence pulled out one of the plants and ran like hell! Well at least she stopped jumping in the beds. My animals are one of the reasons I have only edible plants in my garden. What have you planted? I planted tomatoes, peppers, carrots, radishes, lettuce, celery, spinach, cucumber, zucchini, Swiss chard, basil, beans, eggplant and edible flowers on the edges of the beds. I start planting in Jan. I know I am taking a chance planting so early, but for the last few years it has paid off, and I have tomatoes until October! Now that I have the beds I plan to try some winter planting. How do you plan to keep it watered? I love to water! It is calming and I do my best thinking when I am watering. I did buy a soaker system and may use it when I am away. Before: The raised beds took the place of this grassy area. How much soil? Use the Soil Calculator to determine quantities and get the “recipe” for a good planting mix. This was an idea that came out even better than I had envisioned. The nasturtiums climb all around the bench. Support cages are in place, ready to hold the first crop of peppers. “What makes this plant an orchid and not a turnip?” asks Steve Robinson, enticing visitors like me to stop and chat with him at an exhibit of Latin American orchids. Robinson, a docent at the Smithsonian National Museum of Natural History, carefully shows me the back of an orchid flower, indicating the colorful sepals. “Only an orchid has three sepals that resemble petals, two true petals and one labellum, or lip.” The structurally complex and wildly colored flowers of orchid-family plants have intrigued botanists, collectors and breeders for hundreds of years. A turnip, in contrast, bears simple cross-shaped flowers with four equally sized petals. Turn the flower over and you’ll see four plain green sepals. Kind of ho-hum in the flower world. If you’re lucky enough to visit Washington, D.C., during cherry blossom season, the “Orchids of Latin America” exhibit is worth a visit. Not only is it a feast for the eyes, it also reveals the role that orchids play in the biodiversity of their native habitats, from Mexico to Chile. The show continues through April 21. Here are photos of just a few of the incredible orchids I saw. To learn more about the exhibit, visit Orchids of Latin America. Oh, and if Steve Robinson poses the orchid/turnip question, now you can answer him: It’s all about the unique shapes of the flowers. I’m still waiting for spring. Waiting — impatiently — to get out there and garden. But no matter the weather, you can grow and harvest a crop of microgreens just a few weeks. Kind of takes the edge off. Spring is coming. It’s so close, I can taste it. For more information, read the article, How to Grow Microgreens. It includes a slideshow that explains each step.